This may sound completely stupid, but isn't an entitlement service (like 10Duke, SafeNet etc.) able to do this (at an enterprise level, at least), considering that access could be granted or prevented based on an near-infinite number of rules? Or did I misunderstood what Device Guard and entitlement services do in general? I'm not familiar with those solutions. Device Guard is a pretty effective, built-in whitelisting solution. Obviously, there's other solutions out there. Device Guard is newer and I wanted to bring attention to it. 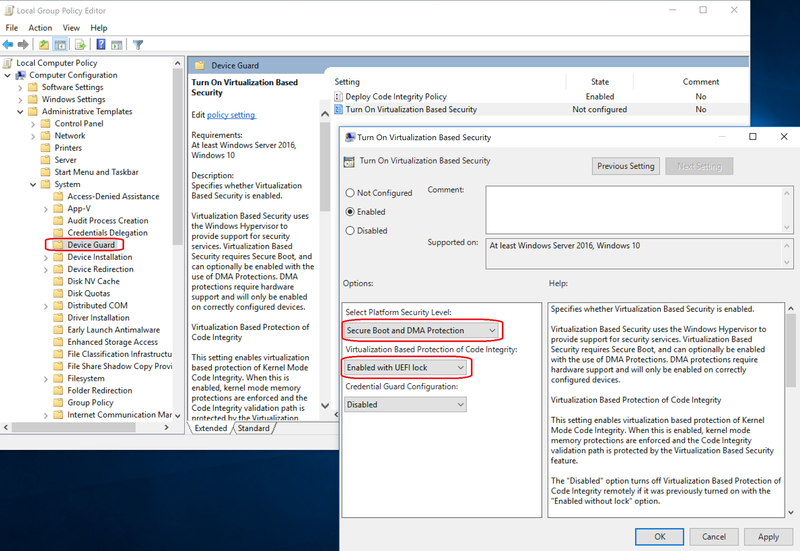 I was working on a security checklist for Windows 10 and became disappointed because there are so many differences between the different versions (Home, Professional, Enterprise, Student). Microsoft needs to get to one version like MAC. Device Guard may be a feature a home user wouldn't use because of the complexity but it doesn't make sense to not have one version from a security perspective. It can make your head hurt trying to figure out what you can do to secure your home computer or small business computer regardless of which version you are running....anyway...thanks for breaking it down barney style :). Is it possible to allow everything except for a few things you want to block? Just Device Guard blacklisting? White listing is to hard/confusing right now, but want to block bypass stuff and enforce constrained language mode. I don't know if that's possible as that is a scenario I've never attempted. I've seen RevokeSIPolicy.p7b lying around so there may be potential there but that's not documented. My theory is that any "approved" rules in a RevokeSIPolicy.p7b will block. If you're wanting to emulate just blocking, scan your system and approve everything at the PCACertificate level and then create your specific deny rules. But if at the end of the day, you're just wanting to block things, then just set some deny ACLs on what you want to block. 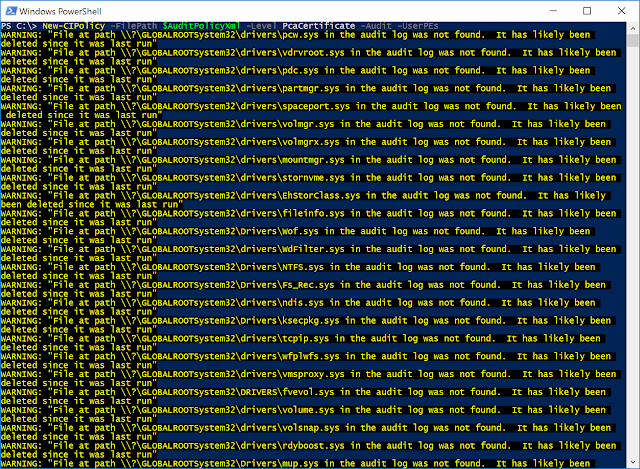 My personal opinion is that CLM enforcement doesn't buy you much if you're not whitelisting other executable file types. Thanks. Applocker is weaker but I can create a "allow all but block these" policy. I feel like all this is pointless unless I do a block all/real whitelisting. "Unable to generate rules for all scanned files at the requested level. 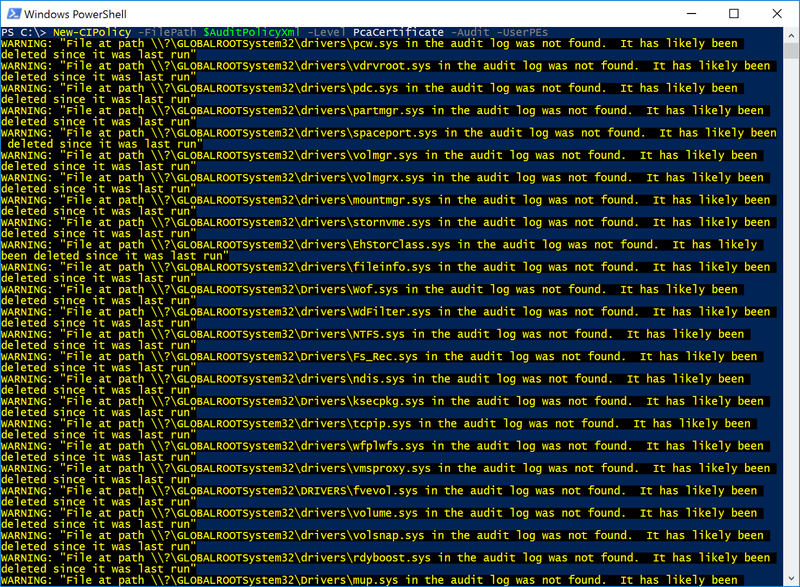 A list of files not covered by the current policy can be found at C:\Users\\AppData\Local\Temp\tmp47F3.tmp. If it is safe to not include these files, no action needs to be taken, otherwise a more complete policy may be created using the -fallback switch"
I agree that AWL is not a worthwhile investment if you're not using for its intended purpose - whitelisting. It is totally normal to see that error. You'll get that when signable code is not signed. A common thing you'll see in the tmp file are a bunch of mofs. Those don't actually need to be signed in most cases (outside of DSC scenarios, I believe). Some code just isn't signed or signed properly though despite being included in the OS.